The University Teachers for Human Rights, whose reports are a mine of information about what happened in the North during the conflict, have sections called ‘Bearing Witness’. These give personal accounts of people caught up in the conflict. These are particularly useful, because one feels that UTHR has no particular axe to grind in quoting from such sources. They present a range of viewpoints, and while obviously one cannot be sure that all accounts are accurate, it is clear that UTHR does not doctor what they hear, or seek to present a particular perspective. This seems to me unlike many other reports, usually by journalists, which produce evidence to emphasize their own predilections. During my recent visit to the North, having looked carefully at various sites that figure prominently in recent critiques of government action, I thought it might be useful to talk to people who had lived through the last few months of conflict in the No Fire Zones. I spoke to three people at the Mullaitivu GA’s office, to two families at Suthanthirapuram and at the Udaiyaarkadu hospital, and to two people at the Vallipuram school that had been used as a hospital. On the next day, I spoke to 18 people at the last two sections in Manik Farm which still house the displaced. Many had only come out at the very end, though a few had got away in April in the first great exodus. One enterprising old man had walked out on March 16th, while two had escaped by sea. One had got away reasonably early together with her husband and a couple of children, paying Rs 200,000 for passage for the whole family. A few weeks later the price had been Rs 200,000 for one person. The school teacher who had got away thus, along with his brother, told me however that the Sri Lankan forces had fired on their boat, killing several, before registering that they were not Tigers. They had then apologized, and treated the survivors well. This was the only story I was told of casualties during escape from the Zone. In fact, apart from stories of individual deaths in a few other cases, this was the only account of people having lost their lives. None of the people I spoke to gave a single instance of women or children being killed. Seven men I spoke to in Ananda Coomaraswamy village in Manik Farm had all got away during the last few weeks with their entire families, one of them with seven children – and a few grandchildren – all now living. Of the seven women I spoke to, four were widows, but two of the husbands had died earlier, of fever and a fall from a tree respectively. All their children had survived, five in one case. I spoke to only four people in Kadirgamar Village, including a man with three small children all of whom had come out safely. There was also an older man on his own, and a young man who was not married but whose whole family had also survived. The woman I spoke to had also lost her husband, but she had brought her children out safely. It is not I think a coincidence that, of these 18 individuals, no family members had died except adult men. One of them seemed, from the way his wife described his death, to have fought with the LTTE, though the other two we were told had died from shells. My assumption seemed strengthened by the story of the family at Udaiyaarkadu, which had seven sons. Six of them had survived, along with their families, and their mother and a single unmarried sister. The only death had been of the sixth son, who according to his eldest brother and their mother had joined the LTTE. I got the impression, from a slight trace of disapproval, that this had been voluntary, but it is possible that he was the sacrifice the family had made when the LTTE demanded one person from each family. The family at Suthanthirapuram had also survived intact, a mother and two daughters and the family of the elder one. The husband of the other was a young man from Nawalapitiya who to my initial surprise knew nothing of the situation. 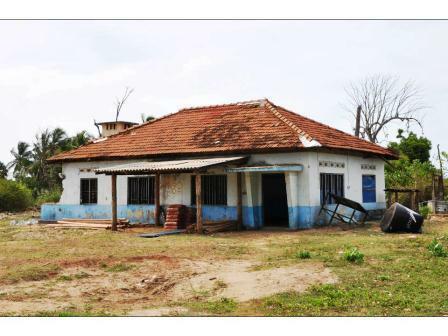 It turned out that he had gone to visit a relation in the Camp at Manik Farm after the conflict ended, and had met his future wife there, and married her and moved to Mullaitivu. This was not however unusual, because a fair number of those I spoke to turned out to have moved there from the south of the country, after the problems that followed the advent to power of the Jayewardene government. Most of those I spoke to were very positive about government, though this could well have been because they thought this was what I wanted to hear. The details they gave about the appalling behavior of the LTTE however suggested deep feeling. 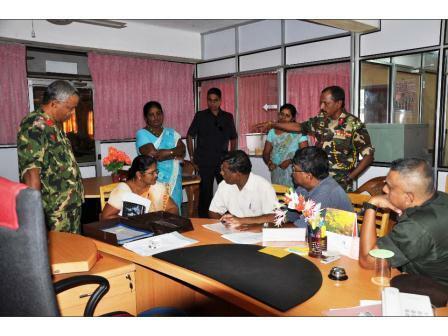 One of them said categorically that the LTTE did not distribute the food that was sent, it arrived and was then whisked away, and that food had to be bought at astronomical prices. Most appalling was the testimony as regards Vallipuram hospital, into which we were told the LTTE brought weapons to fire at the forces. They loaded them on tractors, and fired from amongst civilians, and then moved elsewhere and fired again. I had read in several accounts that this technique was used repeatedly by the LTTE, but it came across the more forcefully when described by an eye witness. In such a situation it is remarkable that the only allegations against the forces with regard to this hospital are one shell on January 21st, with no reported casualties, and two shells in the compound on the 22nd, resulting in five deaths. 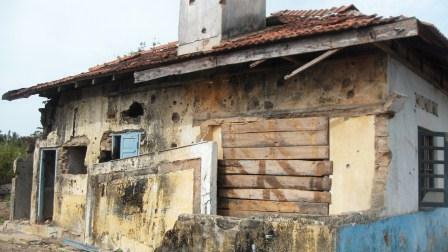 With regard to Udaiyaarkadu, the family living next door assured us that the hospital itself had not been hit, though they noted that shells had hit the compound. I was surprised by this because a corner of the hospital had suffered damage, but they assured me that this had happened afterwards, when there were no patients there. Certainly the tiny anteroom that had been damaged was not likely to have housed patients at any point. The ICRC had informed the government on January 24th that one shell had hit the hospital while another had exploded at the proximity of the hospital compound. It said, but only citing ‘hospital authorities’, that the first shell had led to five killed. TamilNet claimed on the same day that shells exploded inside the hospital premises and added that ‘At least 60 shells exploded behind the hospital premises (Udaiyaarkadu school) around 3.45 pm. Four civilians were killed on the spot’. This suggests that the ICRC communication refers to what took place behind the hospital premises, but since the building used as a hospital was not a school, one wonders what exactly was going on. It would seem that this was a situation in which even more sleight of hand than usual was employed. Examination of the hospital building will make crystal clear that the claims advanced are inaccurate, though it is certainly possible that a shell fell near the hospital and claimed some lives. Finally I should note what we were told about the Vallipuram school, from which many youngsters had been taken to Sencholai, where they died in a bomb attack by the airforce. TamilNet had claimed at the time that 61 schoolgirls were killed in a bomb on a children’s home compound, while attending a ‘residential course on Leadership, Self-Awareness and First Aid workshop’. It will be remembered that initially it was claimed that an orphanage had been bombed. When it was pointed out that the orphanage had been closed several years previously, the story was changed. But photographs, confirmed by some of the survivors, made it clear that the girls were in military fatigues and were being trained for combat. 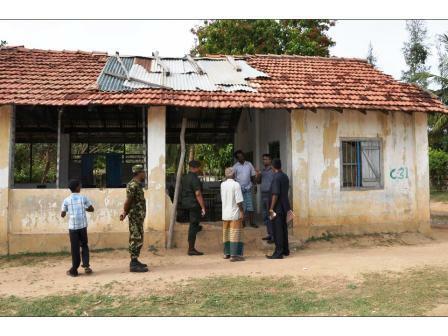 This was confirmed by the witness who said the LTTE would drill students in the school premises, having sent the principal and teachers away. The students were then taken for further military training, the girls to Sencholai, the boys to other places. 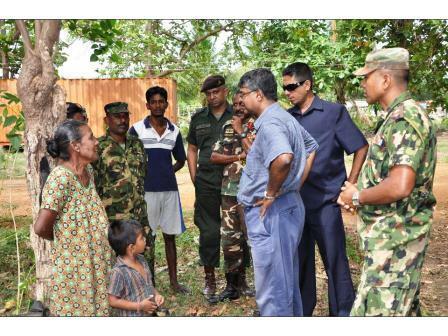 What is horrifying is that the various aid agencies present in the Wanni throughout this period made no protest about this behavior, and did not try to stop this abuse of children, and probably of the funding that the LTTE had obtained from UNICEF to rehabilitated former child soldiers. In Vallipuram it seemed the students forced to train were as young as 13.